Easily grown in medium moisture, well-drained soils in full sun to part shade. Flower color intensity may be best in full sun. Plants may easily be grown from seed and will self-seed in the garden under most conditions. Plants may be grown as annuals, biennials or short-lived perennials. Malva sylvestris, commonly known as common mallow but also known as wood mallow, tree mallow and high mallow, is native to Europe, western Asia and northern Africa. 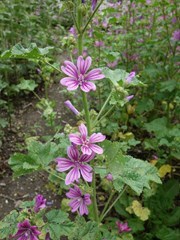 It is similar in appearance to the genera Hibiscus and Alcea. Over time, this species has escaped gardens and naturalized in many parts of the world. In North America, it has naturalized throughout southern Canada and the U.S. except for several States in the Deep South (Louisiana to Florida). Stems typically rise to 2-4’ tall clad with rounded to kidney-shaped, rough-hairy, basal leaves (2-4” long) each having 3-7 shallow lobes. Upper leaf lobes have a more triangular shape. Long-stalked, 5-petaled, bright rose-purple flowers with darker stripes along the petals bloom singly or in 3-5 flowered axillary clusters throughout summer (June to August/September). As the flower petals drop, a small, rounded, disc-shaped fruit (10-20 sections) begins to develop, purportedly resembling the shape of a miniature cheese wheel. This has led to a whole series of additional common names for plants in the genus Malva including cheese, cheeses, cheeseplant and cheeseweed. Genus name is an ancient Latin name. Specific epithet from Latin means growing in the woods. No serious insect or disease problems. Rust typically develops as the summer progresses. Borders. Cottage garden. Wildflower meadow.